It’s that time again…apples, books, and getting a really cool backpack for the first day of school. As a teacher, I used to love back to school shopping… especially back to school clothes shopping. I certainly needed a new green dress to match my new fancy green highlighter. Duh! That is a given. Also as a teacher, I was witness to the hectic day known as “Picture Day.” There is so much commotion in the building and I give those photographers a lot of credit. They shoot at least 100 kids a day and have less than 15 seconds per child to snap the “perfect picture.” However, because of the time constraint, sometimes the pictures are dry, lacking personality and do not bring out your child’s true colors. Do you want something different than the tradition school pictures? Well, I have a solution for you! 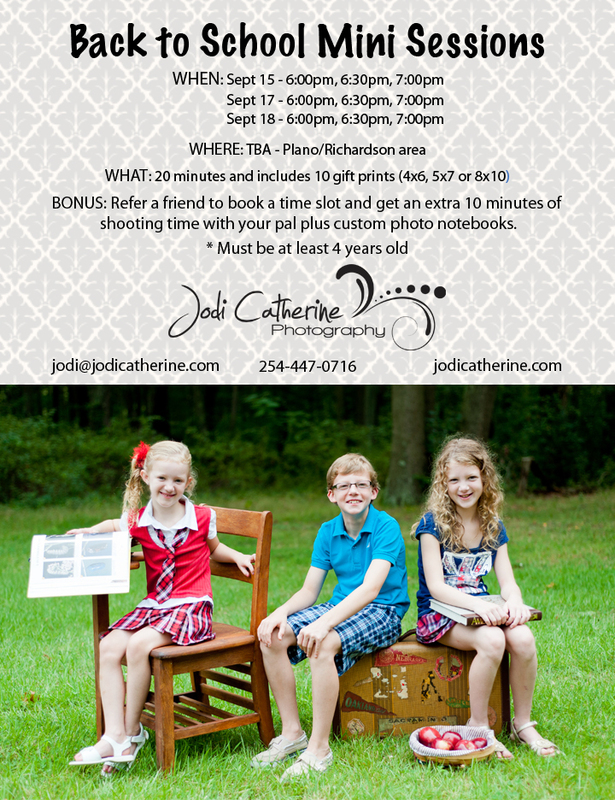 Back to School Mini Sessions! I will spend 20 minutes with your child to ensure that you get a great “school picture.” Email or call to get more information and to schedule your time slot! A $50 deposit is needed to hold your time slot.